When you think about a big top or a calliope, chances are pretty high that the mental image that you have would be “the circus is in town”. Well, when we take a look at the Big Top Calliope over here, it certainly evokes such a feeling, although this will not come with its fair share of clowns or acrobats that perform gravity defying feats, swinging from one trapeze to another. 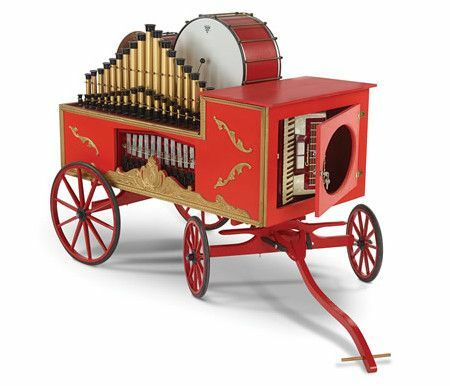 Rather, the Big Top Calliope happens to be a bandwagon calliope that was inspired by the mid-19th century musical wagons which back then, heralded the arrival of the circus. It will remain faithful to the original, where this model’s side-mounted 38 brass organ pipes and front-mounted accordion will make use of forced air in order to produce their classic tones. To keep up with the times, the vacuum created by the on-board air compressor will play the pneumatically operated bass drum and percussion instruments, and it will feature a snare drum, cymbal, triangle, two 12-note glockenspiels, two woodblocks, and a tambourine. There is also a bass synthesizer that delivers a tuba sound. In concert, while the bandwagon replicates the whimsical tooting, clashing, and sparkle of the past by playing 25 classic march tunes, among them include Alexander’s Ragtime Band, Ain’t We Got Fun, and A Tribute To Uncle Sam thanks to a built-in microprocessor.